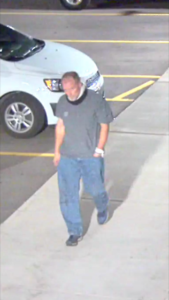 Kalamazoo, MI: On Saturday, September 30, 2017, at approximately 12:40 AM, Kalamazoo Public Safety officers responded to a report of a pedestrian that had been struck by a vehicle on W. Michigan near Greenwood. Upon arrival officers located a victim with severe injuries. The preliminary investigation shows that a vehicle was traveling west on W. Michigan when the victim entered the roadway, crossing in a northwest direction and was struck. The 19 year-old, male victim, was transported to Bronson where he is currently listed in critical condition. The driver of the vehicle was questioned and released at the scene. 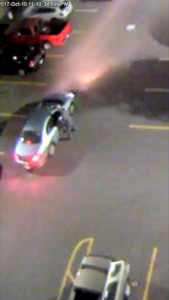 Kalamazoo, MI: On April 23, 2017, at approximately 12:45 AM, Kalamazoo Public Safety Officers were conducting a Directed Patrol in the 2900-block of W Michigan Ave due to repeated complaints of crowds and illegal activity in the parking lot. While officers were walking through the lot an officer detected the smell of marijuana coming from the vehicle and made contact with the male in the driver’s seat. At the same time a second officer was speaking with one of the passengers and noticed a marijuana joint stuck behind his ear. The passenger was asked to step out of the vehicle while officers gathered additional information. During this time officers noticed the subject’s very suspicious behavior, as he continuously attempted to turn his body away from officers. While speaking with the subject, an officer noticed the grip of a gun sticking out of his pocket. The subject was immediately taken into custody. The handgun was reported stolen out of Kalamazoo Township. A 20-year-old male was found to be in possession of a stolen .22 semi-auto pistol. KDPS will be seeking charges for Possession of a Stolen Firearm, CCW, Felony Firearm, Possession of Marijuana, and MIP. The suspect was lodged at the Kalamazoo Co Jail. 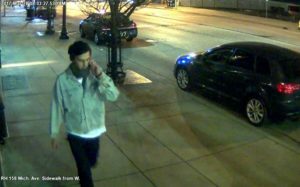 KALAMAZOO, MI: On March 28th, 2017 at about 04:30 AM, an unidentified male was observed on surveillance cameras near 100 W Michigan stealing an inflatable Oberon bottle that stands over 12 feet tall. The advertisement is worth over $2000.00. We are asking for assistance from anyone who may recognize the subject or knows any details about this incident. The suspect may have been in the company of another subject at the time of the theft.